Since the late 1970s, a subgenre of crime fiction, written by women and featuring a professional woman investigator, has exploded on the popular fiction market. Priscilla L. Walton and Manina Jones focus on this recent proliferation of women writers of detective fiction, providing the first book-length study of the historical and societal changes that fueled this popularity, along with insightful and entertaining readings of the texts themselves. Walton and Jones place the genre within its aesthetic, social, and economic contexts, reading it as an index of cultural beliefs. Addressing the ways that Sara Paretsky, Sue Grafton, Marcia Muller, and others work through the conventions of the "hard-boiled" genre made popular by writers such as Dashiell Hammett, Raymond Chandler, and Mickey Spillane, the authors show how the male hard-boiled tradition has been challenged and transformed. Issues of child, spousal, and sexual abuse are more likely to surface in women's detective novels, the authors show, and female sleuths face many of the same dilemmas as those who read about them—everyday problems with relationships, parenting, and money. 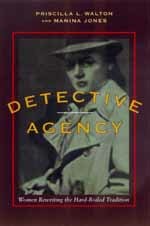 Detective Agency also integrates interviews with authors and publishers, reader surveys, publication data, and analysis of internet discussion groups to present a fascinating picture of the "industry" of women's detective fiction. Authors of these works are powerful players in the publishing system as well as agents of cultural intervention, Walton and Jones claim. They conclude by examining the rise of female detectives in television and film. Priscilla L. Walton is Professor of English at Carleton University, Ottawa. She is the author of Patriarchal Desire and Victorian Discourse: A Lacanian Reading of Anthony Trollope's Palliser Novels (1995) and The Disruption of the Feminine in Henry James (1992). Manina Jones is Associate Professor of English at the University of Western Ontario. She is the author of That Art of Difference: 'Documentary-Collage' and English-Canadian Writing (1993).